Team 341, Miss Daisy – What is FIRST? FIRST® stands for “For Inspiration and Recognition of Science and Technology.” Its mission is to inspire young people to be science and technology leaders, by engaging them in exciting mentor-based programs that build science, engineering and technology skills, that inspire innovation, and that foster well-rounded life capabilities including self-confidence, communication, and leadership. 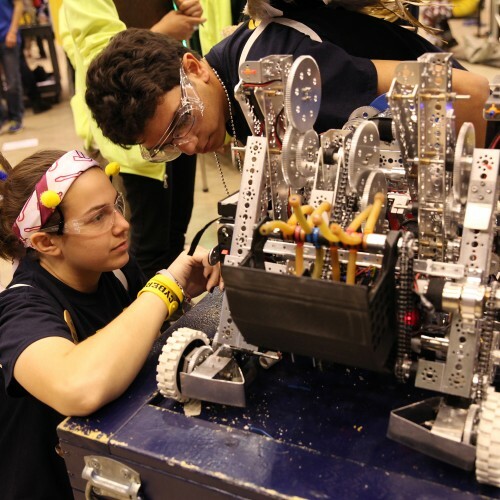 In 1992 FIRST® began the FIRST® Robotics Competition with 28 teams and a single 14 x 14 foot playing field in a New Hampshire high school gym. Today, it has more than 2,000 teams participating nationwide and internationally, in over 60 Regional events and in a culminating Championship event in April of each year. 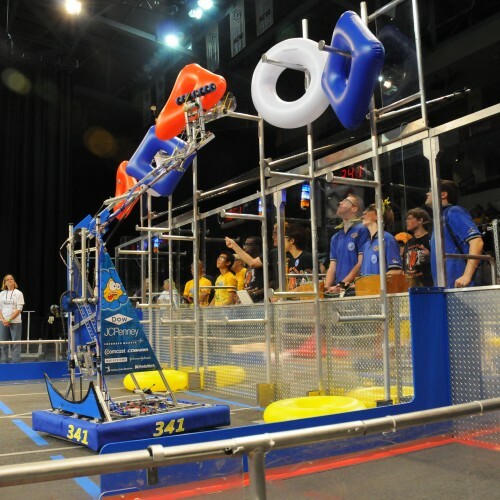 FIRST® Robotics Competition (FRC®) is a unique varsity sport of the mind designed to help high-school-aged young people discover how interesting and rewarding the life of engineers and researchers can be. The FIRST® Robotics Competition challenges teams of young people and their mentors to solve a common problem in a six-week timeframe using a standard “kit of parts” and a common set of rules. Teams build robots from the parts and enter them in competitions designed by Dean Kamen, Dr. Woodie Flowers, and a committee of engineers and other professionals. FIRST® redefines winning for these students because they are rewarded for excellence in design, demonstrated team spirit, Gracious Professionalism™ and maturity, and the ability to overcome obstacles. Scoring the most points is a secondary goal. Winning means building partnerships that last. What is unique about the FRC® program? 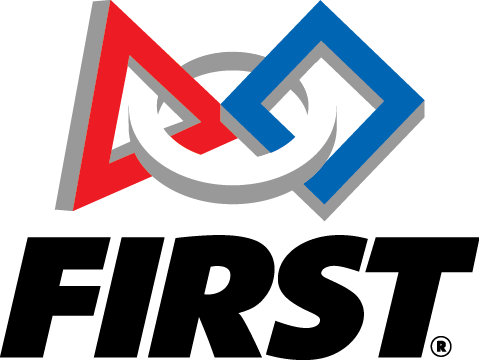 Learn more about the FIRST® Robotics Competition at the official FIRST® website. Learn more about the FIRST® Tech Challenge at the official FIRST® website. FIRST® LEGO® League (FLL®) is an exciting and fun global robotics program that ignites an enthusiasm for discovery, science, and technology in kids ages 9 to 16. 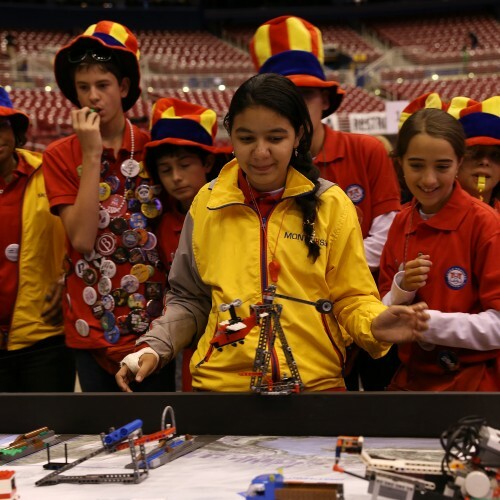 Each year FLL® teams embark on an adventurous Challenge based on current, real-world issues. Guided by a team coach and assisted by mentors, the kids research and solve a real-world problem based on the Challenge theme, present their research and solutions, and build an autonomous robot using engineering concepts. Learn more about the FIRST® LEGO® League at the official FIRST® website. The newest FIRST® program, FLL® Junior introduces the youngest students to the exciting world of science and technology. Just like FLL®, this program features a real-world challenge, to be solved through research, critical thinking and imagination. Guided by adult coaches, students work with LEGO® elements and moving parts to create solutions and present them for review. Learn more about the FIRST® LEGO® League Junior at the official FIRST® website.